Over the past decade, we’ve seen technology transform industries including financial services, entertainment and health care. Today, Silicon Valley is helping to deliver fresher, healthier food—and I don’t mean via food-delivery apps. Though technology isn’t yet ubiquitous in the food-and-beverage industry, brands shouldn’t ignore emerging trends. The adoption of new technologies has always been an effective way to differentiate one product or brand from another. That’s especially true for legacy brands and traditional businesses—like brick-and-mortar grocery stores—that may struggle to prove their relevance in an age of online shopping and meal-delivery kits. While gimmicks aren’t a guaranteed recipe for success, businesses shouldn’t be so quick to dismiss these technologies as a passing fad. In fact, many of these innovations are bringing people closer to the food-making process itself, giving customers the immersive experiences that they crave in today’s Instagram-ready world. Here are three emerging food technologies to keep in your sights. Remember how Joan Jetson would press a few buttons and voila…dinner ready to eat and on the table? With 3D printable-food technology, users can do just that: press a button that activities a series of nozzles, lasers and robotic arms, and cook a hamburger, pastry, pasta or quiche…in minutes. Though there’s still a long way to go with printable-food technology, the prospect is exciting for several reasons. First, it offers a fast, customizable and a healthier alternative to a preservative-laden fast-food meal. The technology also marries art and science, creating beautiful and edible works of art. In 2015, chef Josiah Citrin, of the Michelin-starred Melisse in Santa Monica, prepared an exquisite, first-of-its-kind 3D-printed crouton as part of 3D System’s “culinary lab” in Los Angeles. It’s only a matter of time before restaurants and food-specialty stores tap into the exciting possibilities of 3D printable food as part of both a marketing and operational strategy. Robots are coming to a restaurant near you! 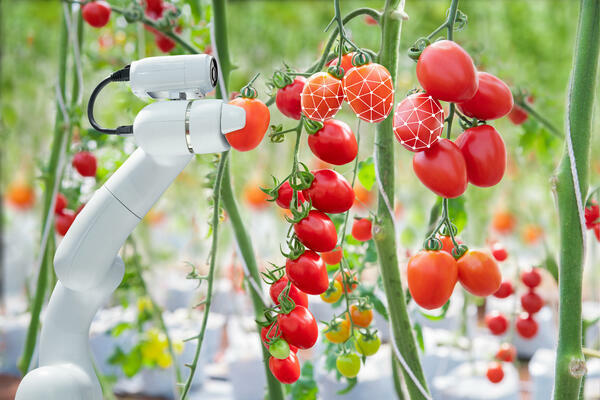 According to the Robotics Industry Association, in 2018, there was a 48% increase in the number of food-related robots shipped in North America compared to the previous year, making food and consumer goods one of the top non-automotive sectors buying robots. Some restaurants are going all-in on robotic automation. Last year, San Francisco’s Creator debuted the first fully automated burger-assembly robot, which can churn out up to 400 made-to-order burgers in an hour. By cutting down on payroll costs, the burger joint can use higher-quality ingredients and keep prices low (a Creator burger sells for $6, roughly the price of a Big Mac, and is getting rave reviews). People are also flocking to Creator for the entertainment value—customers watch the entire process through a glass enclosed case. Technology isn’t just for creating a more efficient cooking process. It’s also playing a part in what goes onto the plate. Silicon Valley investors, including some of the biggest names in business, are pouring millions into companies creating animal-free meat, that’s not an oxymoron but an innovation designed both as a money-maker and to curb the effects of climate change (livestock accounts for 14.5% of global greenhouse gasses). Berkeley, Calif.-based Memphis Meats isn’t looking to perfect the veggie burger, it’s using cellular agriculture to create “clean” or “cultured” meat from animal cells. Alternatively, companies like Beyond Meat use plant-based matter like pea protein, running it through a heating, cooling and pressure process to realign the protein so it takes on the structure of animal protein. In 2017, Kroger, the largest U.S. grocery chain, became one of the first mainstream supermarkets to begin selling Beyond Meat—in the meat aisle no less. With the demand for vegan products only intensifying, food retailers have a double benefit to carrying these products, marrying lucrative sales with the halo effect that comes from supporting an urgent environmental cause. Could your business use an extra dose of creativity? Click the image to download our free ebook to learn more about how to reinvigorate your business with fresh and innovative ideas.